Onyewu's strong play at the 2006 World Cup drew interest from powerhouse clubs such as Chelsea, Real Madrid and AC Milan in the January 2007 transfer window. However, Onyewu choose a loan move to Newcastle United of the English Premier League. At the end of the season the team opted not to keep him, and he returned to Liege for the 2007-08 season. A regular for Liege's championship run in 2007-08, Onyewu was linked with multiple teams. Instead, he remained a member of Liege,winning a second title in 2008-09. On July 7th, 2009, Italian super club AC Milan announced they had signed Onyewu to a three-year deal. Onywu was injured in the final game of World Cup Qualifying, missing the rest of the season with Milan but returning in time for World Cup camp. In January, 2011, he agreed to finish the season on loan to FC Twente in the Dutch Eredivisie. On June 20th, 2011 Onyewu signed with Sporting. He spent the 2012-13 season on loan with Malaga in Spain's Primera Division and left Sporting in August, 2013. In October, 2013 he signed with Queens Park Rangers, moving to Sheffield Wednesday in Jan 2014 and Charlton Athletic in 2014-15. He signed with Philadelphia for the 2017 MLS season. Onyewu announced his retirement on Sep 17, 2018. In December, he joined USL club Orlando City B as technical director. 2014: Started against Ukraine on Mar 5. 2013: Started against Guatemala on Jul 5 and Cuba on Jul 13. 2012: Subbed on against Scotland on May 26th. 2011: Started against Argentina on March 26th. 2010: Played in both Sendoff Series games and was named to the World Cup roster. Started against England and Slovenia. Scored in the Oct 9th friendly against Poland. Named captain for the Oct 12th game against Colombia. 2009: Once again partnering Carlos Bocanegra as the first choice central defenders in the US system. Huge in defense during the Confederations Cup, with a standout performance in the semifinal win over Spain. Injured his knee in the final game of World Cup Qualifying. 2008: Capped a fine 90 minutes against Mexico by scoring the game's opening goal in 2-2 February exhibition game. 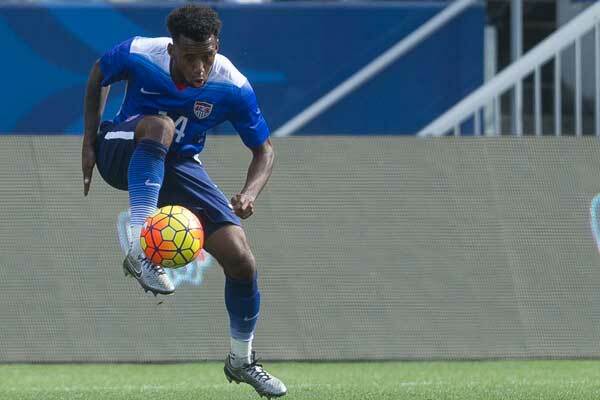 Scored against Cuba on Oct 11th. 2007: Member of Gold Cup squad, becoming regular starter with Carlos Bocanegra in central defense. Made 11 starts over the course of the year, scoring in exhibition win over China. 2006: Made six appearances, including three starts at the World Cup. 2005: Scored first US goal by heading home a Landon Donovan free kick in added time to beat Honduras and put the US side through to the Gold Cup final. Voted to Gold Cup Best XI. Started in four of six Gold Cup matches, including the final. Won MVP in 2-0 to win over Mexico in World Cup qualifier. Won nine caps over the course of the year. 2004: Called into camp multiple times. Earned first cap as a reserve in the World Cup Qualifier against Panama in October. 1998: Debuted with the U-17s against Guatemala. Scored first international goal in December against the Solomon Islands in New Zealand. 2017: After a year out of the game, signed with the Philadelphia Union in January. Left the club at the end of the season. 2014-15: Signed with Charlton Athletic in the Championship in November on a short-term deal through the end of the season. Finished in 12th-place in the Championship. 2013-14: Signed with Queens Park Rangers on Oct 23. Signed with Sheffield Wednesday on Jan 12, 2014. 2012-13: Finished 6th with Malaga in Spain, returning to Sporting at the end of the season. Parted ways with Sporting at the end of August. 2011-12: Finished 4th with Sporting and was loaned to Malaga in Spain for the 2012-13 season. 2010-11: Returned to Milan from World Cup duty. Loaned to FC Twente in January. Returned to Milan at the end of the season. Announced on June 28th, 2011 that he had signed with Sporting in Portugal for three seasons. 2009-10: Injured in the October World Cup Qualifier with Costa Rica missing the rest of the Serie A season. 2008-09: Another title with Liege, this time decided by a two-game playoff with Anderlecht. Joined AC Milan at the end of the season. 2007-08: As a starter, Onyewu helped Liege to a championship, losing only once this season. 2006-07: After being linked with a number of elite European clubs, Onyewu was loaned to Newcastle United. A change in management at the end of the season saw him return to Standard Liege. 2005-06: Remained a first choice for Liege. 2004-05: Liege exercised an option in October to keep Onyewu. Clinched a starting role, and was considered one of the best defenders in the Belgian league. 2002: Signed a four-year contract with FC Metz of the French First Division.